Director – James Bobin, Screenplay – Linda Woolverton, Producers – Tim Burton, Joe Roth, Jebbifer Todd & Suzanne Todd, Photography (3D) – Stuart Dryburgh, Music – Danny Elfman, Visual Effects Supervisors – Ken Ralston & Jay Redd, Visual Effects – Double Negative (Supervisors – Jesper Kjolsrud & Ollie Rankin) & Sony Pictures Imageworks, Special Effects Supervisor – Neil Corbould, Creature Effects – Legacy Effects (Supervisors – Shane Mahan & Alan Scott), Makeup Design – Peter Sword-King, Production Design – Dan Hennah. Production Company – Disney/Roth Films/Team Todd. Following her father’s death, Alice Kingsleigh has become the captain of his ship The Wonder. Upon her return home, she discovers that Hamish Ascot, the man whose marriage proposal she rejected, has taken over her father’s company, their house and is about to force her mother to sign over the ship too. Alice escapes from the Ascot society ball through a mirror and returns to Wonderland. There she finds that everybody considers that The Hatter has gone completely crazy. She finds him and he is insistent that his family are still alive. Alice ascertains that the only way to help The Hatter is for her to go to Time and obtain The Chronosphere that will allow her to travel back through time and save The Hatter’s family from being killed by The Jabberwocky. She goes to Time to ask to borrow it but Iracebeth, the former Red Queen, also seeks The Chronosphere. Snatching the Chronosphere and journeying into the past of the Wonderland characters, pursued by Time, Alice seeks to help The Hatter. 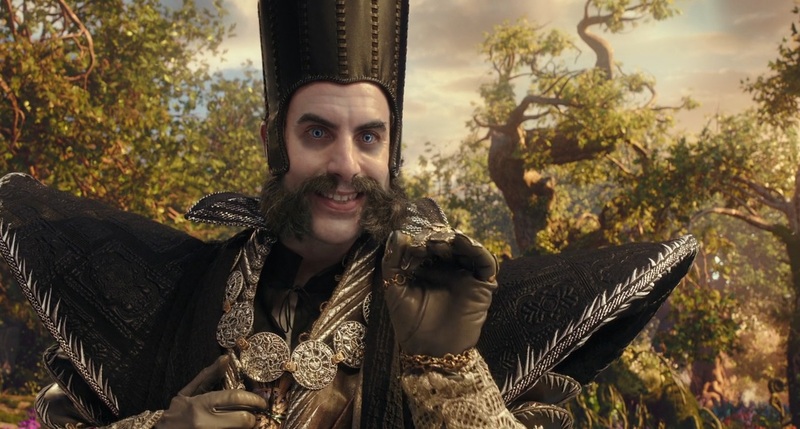 Alice Through the Looking Glass is a sequel to the Tim Burton version of Alice in Wonderland (2010). The film received almost universal criticism for its wide departure from Lewis Carroll’s text and allowing it to be subsumed by the Tim Burton kookiness. What could not be denied was that Alice in Wonderland was a box-office success – the second highest grossing film of 2010, a large part one suspects because it was one of the first post-Avatar (2009) films to jump aboard the 3D fad. The success naturally led to this sequel. While all of the principal cast repeat their roles and Linda Woolverton delivers the script again, Tim Burton steps back to a producer role. The actual director’s chair has been inherited by James Bobin, a director/writer on comedy shows like Da Ali G Show (2003-4) and Flight of the Conchords (2007-9) before having a more than reasonable success on cinema screens with the revival of The Muppets (2011) and its follow-up Muppets Most Wanted (2014). No film version of Alice in Wonderland has ever produced a sequel before. That said, there is some precedent for this in that Lewis Carroll produced a sequel to the Alice in Wonderland book with Through the Looking-Glass, and What Alice Found There (1871). What should be noted is that while it appropriates the title, the film here bears even less resemblance to Through the Looking Glass than the 2010 Alice in Wonderland did to its respective book. There are only two scenes in the film that have been taken from the book – one being Humpty Dumpty’s fall with all the king’s horses and all the king’s men coming to put him back together again, and the other where Alice returns to Wonderland through a mirror. Certainly, it should be pointed out that the 2010 film ransacked Through the Looking Glass for a number of characters – the Red Queen, the White Queen, Tweedledum and Tweedledee, and The Jabberwocky – all of which are actually only appear in that book rather than Alice in Wonderland. What Alice Through the Looking Glass does end up being is a sequel/prequel to Alice in Wonderland. There is the introduction of the character of Time and a time travel plot for the specific reason of going and visiting younger versions of the characters. 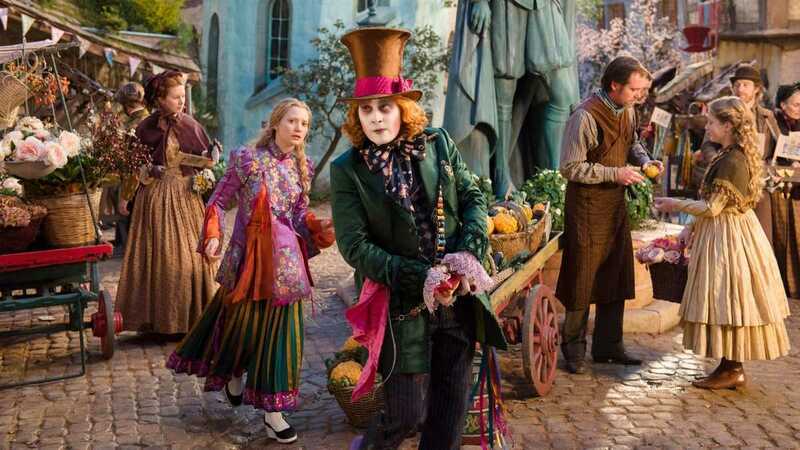 What should be noted is that the film here offers up origins of the characters as interpreted in the 2010 film as opposed to the Lewis Carroll originals – how the Red Queen got her swollen strange-shaped head, the story of the Mad Hatter’s family – which are based on the way the characters were represented in the 2010 film and contain aspects that do not appear in the books. This falls into the modern fad for telling origin stories wherein we get to see how familiar characters came to be and what happened in the background of the main saga. This is something that works precisely to the extent that one is invested in the franchise – from the low box-office enjoyed by Alice Though the Looking Glass (a quarter of what the first film earned), most audiences were not. Alice Through the Looking Glass is routine fantasy. There are all the sets, the weird and wacky costumes but beyond making these looking impressive, James Bobin fails to give the show much in the way of imaginative sparkle. There are various special effects set-pieces, most notably with Alice venturing back through time, but this is little more than eye candy. Among the returning cast, Mia Wasikowska is present but does nothing much, while Johnny Depp, who can usually be relied on to give an offbeat performance, is surprisingly restrained. I expected the new arrival Sacha Baron Cohen to liven things up with his unique brand of genius but even he is not up to much. It is only Helena Bonham Carter who once again gives the show its life with her haughtily autocratic Red Queen, bringing the house down with lines like “Haaaa, earthquake” as she shakes up an ant farm or impulsively snapping the carrot nose off a vegetable courtier and eating it. (Nominee for Best Supporting Actress (Helena Bonham Carter) and Best Production Design at this site’s Best of 2016 Awards). James Bobin subsequently went on to make the live-action film of Dora the Explorer (2019).